NSGIC fully supports the bipartisan Geospatial Data Act. The bill establishes a clear vision, assigns responsibility, provides authority and ensures oversight of Federal activities by Congress. These improvements will help ensure that the US is able to build a robust National Spatial Data Infrastructure (NSDI). Support of this legislation is a critical step toward building more resilient communities by ensuring they will have access to the consistent high-quality data they need to do their jobs. Bert Granberg, past president of the National States Geographic Information Council (NSGIC), said upon the bill's initial May introduction, "From transportation, to natural resources, to homeland security, map-based digital information has quietly become mission critical to how work gets done and to future economic growth. We need an efficiency and accountability framework to build, sustain, and share geographic data assets for the entire nation. The GDA delivers just that." Despite robust efforts around the country to create and sustain geospatial data, taken as a nation, there are still substantial and significant unmet needs. Much of the unmet need stems from a failure to harness and coordinate existing efforts. This failure to bring it all together is evident a critical GAO review of FGDC and NSDI efforts. The finding is further supported in the 2015 NSDI Report Card produced by a panel of national experts for the Coalition of Geospatial Organizations (COGO). 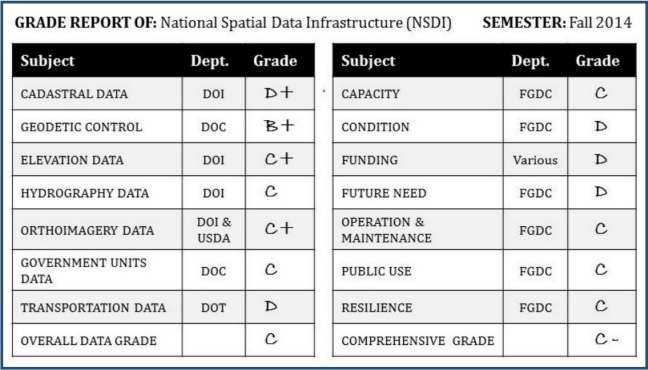 The expert panel assigned an overall grade of C to the status of framework data and an overall grade of 'C-' for the infrastructure required to support the data (see below). Cadastral—Information that supports and documents land ownership. Elevation—The height and surface of the land and depth of water bodies. Governmental Units—The boundaries and names of government jurisdictional and management areas at all levels of government. Hydrography—Streams, water bodies, watersheds, inundation areas and shorelines. Orthoimagery—Precision located aircraft and satellite aerial photography and imagery. Codify the existing executive orders and other guidance documents that direct work by the Federal Geographic Data Committee (FGDC) toward the NSDI. Provide Congressional oversight over geospatial activities of FGDC members and other agencies. Require reporting that will allow Congress to track progress on the NSDI and ensure funding is spent wisely. Provide a great deal more clout to input developed by the multi-sector membership of the National Geospatial Advisory Committee (NGAC) and require the FGDC to address NGAC’s concerns — not just dictate what NGAC should work on. Require Federal agencies to coordinate and work in partnership with other Federal agencies, agencies of state, tribal and local governments, institutions of higher education, and the private sector to efficiently and cost-effectively collect, integrate, maintain, disseminate and preserve geospatial data. Coastal issues have enormous consequences for NSGIC member states and state GIOs work with coastal managers to help improve resiliency efforts. As a charter member of the Digital Coast Partnership, NSGIC has actively worked with other Digital Coast partners and MAPPS (the trade association for private sector geospatial firms) to promote legislation that will authorize the Digital Coast Program managed by the National Oceanic and Atmospheric Administration (NOAA) Office for Coastal Management. The Digital Coast Act was reintroduced in the 115th Congress as S.110 by Senators Tammy Baldwin (D-WI), Lisa Murkowski (R-AK), Dan Sullivan (R-AK) and Cory Booker (D-NJ) on January 12. In late May, the bill passed the Senate without amendment under unanimous consent. Supporting the Digital Coast Act is a critical step toward building more resilient coastal communities. Funding NOAA's Digital Coast Program will prevent costly duplication of effort by multiple state and local governments. Benefits of Digital Coast have been documented by NOAA as 3.5 times greater than the costs, translating into a return on investment of nearly 250 percent. The Digital Coast Partnership includes seven other national organizations, including the American Planning Association, Association of State Flood Plain Managers, Coastal States Organization, National Association of Counties, National Estuarine Research Reserve Association, The Nature Conservancy and Urban Land Institute. Together, we work with NOAA to provide improved data, tools and training to federal, state and local coastal managers to improve management practices and coastal resiliency. NSGIC held its first Coastal Caucus in 2007 to ensure adequate information exchange at our conferences on coastal geospatial issues. Coastal ecosystems are highly productive areas boasting rich biodiversity, and the coastal communities that depend on these resources provide nearly 60 percent of our nation's gross domestic product. More than half of the nation's population lives in only 17 percent of the U.S. land area defined as coastal, and population densities within coastal counties are six times that of inland counties. The effects of climate change, sea-level rise and increasing populations are becoming more pronounced and take a serious toll on the national economy. These threats translate into significant social and economic costs to communities: Hurricane Katrina cost $134 billion in total damage; flood damage costs are approximately $6 billion annually; and poor water quality translates to reduced ecological diversity, habitat function, and associated ecosystem services and is also a public health burden that has high costs. The costs are also measured in human lives. Katrina killed more than 1800 people after striking Louisiana and Mississippi as a major hurricane in 2005. Superstorm Sandy, which hit the U.S. East Coast in October 2012, caused unprecedented damage, flooded subways, closed down all major airports and more than 15,000 flights, claimed more than 100 lives.